Please contact owner Barry at 606-402-1748. Boat is located in Butler, Kentucky. 1998 17 1/2 ft Sea Nymph Tournament Pro Series Aluminum Boat. 80 HP late model Mercury Outboard with power trim and tilt / Stainless Prop. All Aluminum floor, deck and door lids. Never worry about rotting wood. New 20 oz navy blue carpet / Hummingbird fish finder. Built in Am/Fm stereo / Electric Anchor- costs 200 dollars at bass pro shops. 3 batteries- 2 aerator-ed live wells- automatic bilge pump. Like new trailer tires with new spare tire and rim/ buddy bearings on trailer wheels. Transom ratchet tie downs / Drive on trailer. Mini Kota bow mount trolling motor/ 54 inch shaft/ 55 lb thrust just like the one presently listed on Craigslsit for 925.00. 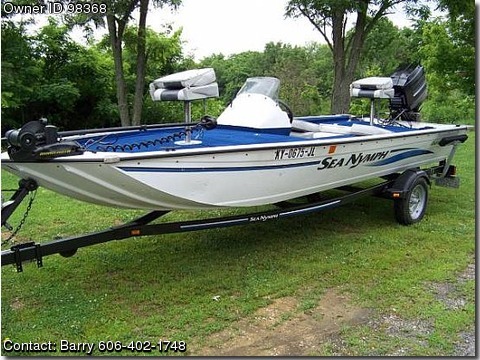 Excellent Bass or Crappie Boat.